CHANTILLY, VA. — 1982 MLB Hall of Famer & 14X MLB All Star, Frank Robinson, will appear on Saturday July 12, 2014 at The 2014 Chantilly Show. The event is located at Dulles Expo Center, 4320 Chantilly Shopping Center Chantilly, VA. Pricing is $100 for small flats/ balls, $130 16×20’s/ caps/ eqpt, $225 bats/ jerseys & $50 ins. Mr. Robinson will not do Photo Ops. Photo shows MLB Hall of Famer, Frank Robinson, speaking about the Youth Baseball Academy. 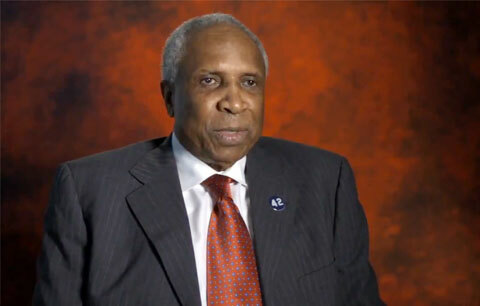 Watch 2013 video where MLB Hall of Famer Frank Robinson reflects on the importance of the Youth Baseball Academy providing organized baseball in the lives of children. Frank Robinson is a former Major League Baseball outfielder and manager. He played from 1956 to 1976, most notably for the Cincinnati Reds and the Baltimore Orioles. He was elected to the Baseball Hall of Fame in 1982. He was the first African-American hired to serve as manager in Major League history. If you would like to book Frank Robinson for a speaking engagement, autograph signing or personal appearance, contact Frank Robinson’s booking agent for appearance & speaker fees at PFP Talent Agency or call 1.800.966.1380.